Hello! Welcome to day 2 of Taylored Expressions August Sneak Peeks! 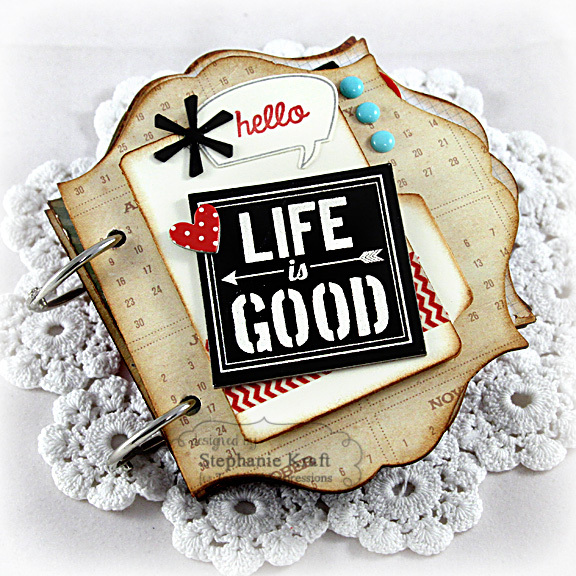 Today the Baker's Dozen has another day of sneak peek projects highlighting some of our new stamps and dies! All products will be released on Thursday, August 8, @ 8 AM PST. 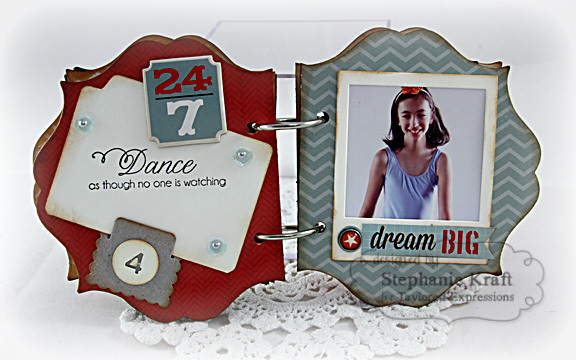 Today I am previewing one of the new dies, Circle Numbers. 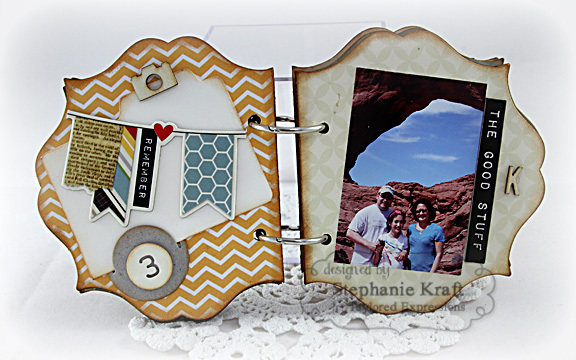 I made a mini album using it plus several other new dies and stamps. I started by using the new Label Stacklets 4 (the largest stacklet) for the base of my book (I slightly cut off one side to make a straight edge on the left). Each page was cut out of chipboard then adhered with paper from the Simple Stories 24/Seven collection. I also used chipboard stickers and decorative brads from the same collection. Love how they coordinate so well for this mini project! On the cover (above), I used the Say What? stamp set and coordinating Say What Conversation Bubbles dies. The asterisk is from the From the Desk of die set and the folder is the new Manila Folder die. Pages 2-3: Stamps used: Say What? (the i ♥ u). Dies used: Manila Folder, Clip It On, Circle Numbers (left side); Notepaper & Clipboard and Simple Tabs (right side). Pages 4-5: Stamps used: Office Ephemera (original). Dies used: Clip It On and Circle Numbers (left side); Manila Folder (right side). Pages 6-7: Dies used: Manila Folder, Clip It On, Circle Numbers (left side). Pages 8-9: Stamps used: Life is a Dance. 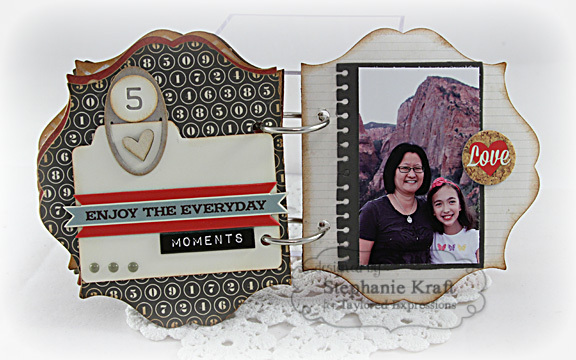 Dies used: Manila Folder, Clip It On, Circle Numbers (left side); Instant Photo Frames (right side). Pages 10-11: Dies used: Manila Folder, Clip It On, Circle Numbers (left side). Notepaper & Clipboard (right side). Accessories: Taylored Dies: Circle Numbers, Clip It On, From the Desk of, Label Stacklets 4, Manila Folder, Say What Conversation Bubbles, Instant Photo Frames, Notepaper & Clipboard, Simple Tabs (TE); 24/Seven chipboard stickers & decorative brads (Simple Stories), Washi tape, Tiny Attacher (Tim Holtz), Pearls, Enamel dots (MME), Wood veneer (Studio Calico), Foam tape, Binder rings. It's wonderful! I love it! You did such a fantastic job on this cute mini book. I love all the new things coming out. Your mini album is absolutely fabulous, Stephanie!!!! You have created a masterpiece with all the stamps, diecuts, and beautiful pictures of your family....I sooo need to case this!!!! Oh my Stephanie! What a fun mini album FULL of so many sweet photos! Love all your attention to detail! I can appreciate the time you put in to make this treasure! Love the mini album!! Sweet job! I love your album, Steph! It is so full of precious pics! LOVE! I love everything about your beautiful project, Stephanie!! !